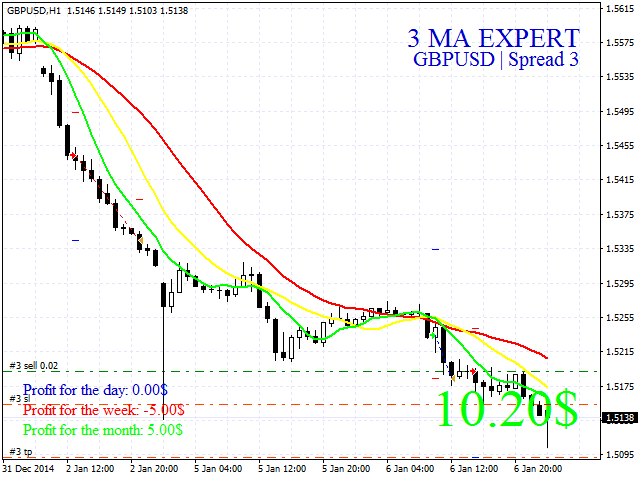 3 MA EXPERT works using three well-known Moving Average indicators with different periods. The tactics is quite popular. The middle МА crossing the upper one means buy, while crossing the lower МА means sell. If a deal yields a negative result, the EA uses a smooth martingale to recover avoiding huge drawdowns. In conjunction with three indicators, the results can be quite reliable. 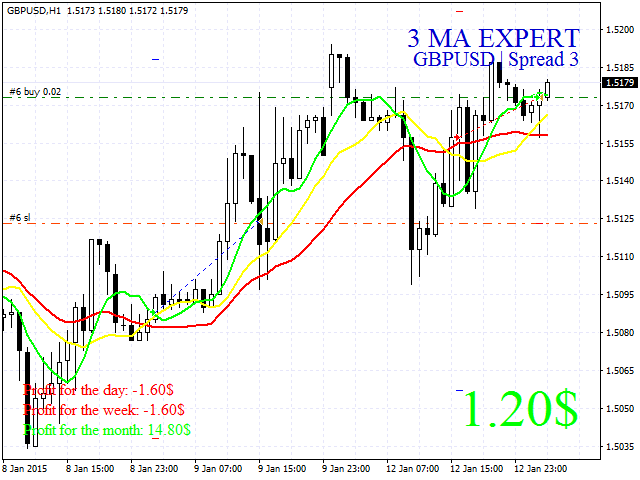 The EA allows you to choose trading by bars, set trailing stop, breakeven, and trading by time for each day of week! All settings are customizable. Attention! The price of the EA will rise after few purchases! Auto Lot - automated lot calculation, as 0.01 for a specified sum. For example, in case of 100, lot for $200 is 0.02, etc. Lot - initial lot. If auto lot is enabled, the option does not work! K - lot multiplier for martingale. 0 - disabled! 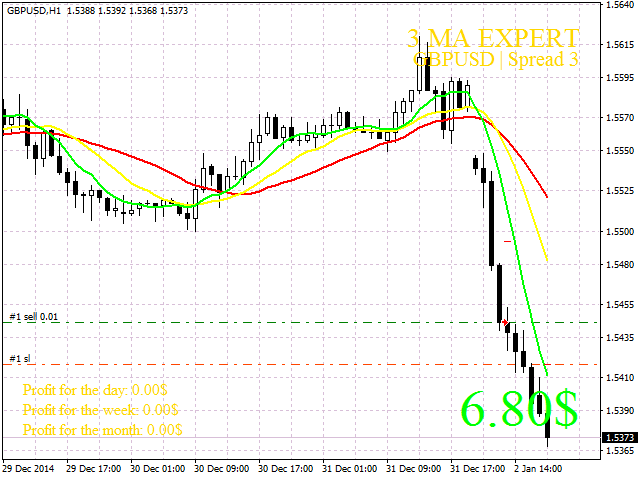 Max Spread - maximum allowed spread. If 0, the option does not work! Breakeven - breakeven in points (number of points, after which the breakeven is enabled). The sum of the breakeven - number of points to be protected by breakeven. Trailing Stop - trailing stop. MA period top MA - upper МА period. Shift MA top MA - upper МА shift. The method of averaging MA top MA - upper МА method. Price type MA top MA - apply to upper МА prices. Shift MA - МА shift by Х bars. This parameter is followed by similar settings of the two remaining indicators and time settings for each day of week (minutes and hours can be set). If start and stop hours are set to zero, the robot works round the clock. Color buy - buy order color. Color sell - sell order color. Info - enable/disable data and charts. Language INFO - chart language (Russian/English). Text color - main text color. Text Profit color - profit color. Text Loss color - drawdown color. Deposit currency - deposit currency. Default - US dollars.